I have been thinking about planetary magnetospheres and how they could become visible in some circumstances. I think that if a sufficiently dense plasma gets trapped inside the radiation belts of a planet (as Jupiter) it could in principle, glow in visible colours. The solar corona has a plasma density of 10^15 particles/m^3 and it's sufficient to start glowing at that temperature. The magnetic field of some exoplanets could have a huge injection of plasma from it's parent star's wind, creating sufficiently dense and hot plasma as to make them visible. For example, this could be a frequent phenomena in planets orbiting Wolf Rayet stars because of the high density stellar winds that an intense magnetosphere could trapp. Maybe this is a common feature also in "Hot Jupiters". I supposed that the glowing plasma should be confined in a toroidal shape at the magnetic equator of the planet with some tenuos filaments following the field lines. There's an image I think resembles the idea. 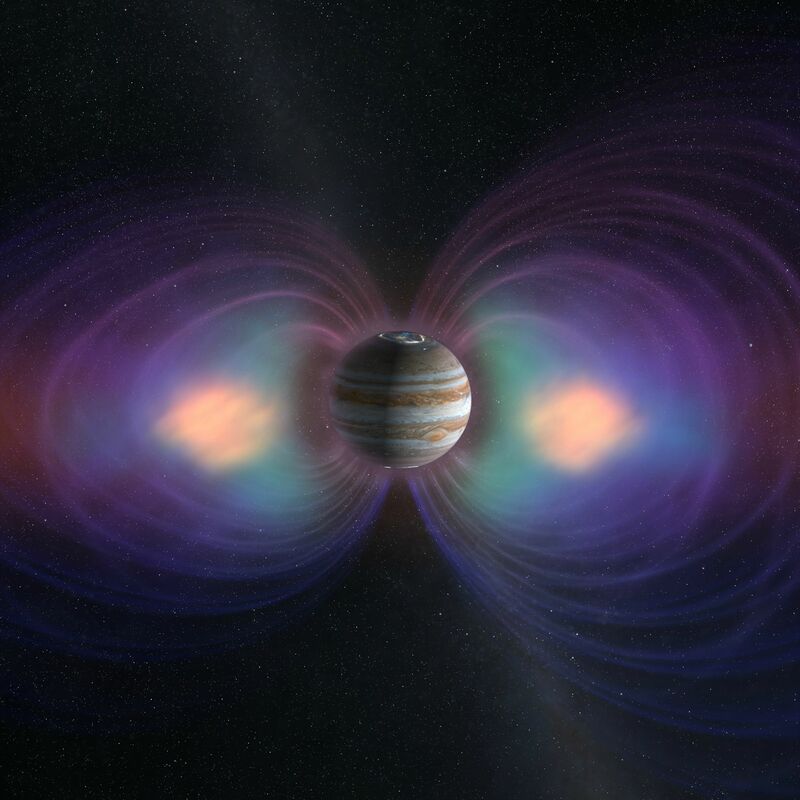 It's a visual representation of Jupiter's magnetosphere made by a NASA artist, but you can interprete that as what a "Plasma Planet" would look like. Immagine placing Jupiter near the sun and intensifying it's field (so it's not destroyed by the intense solar wind). It's soo beautifull immagine Space Engine with this. I would love to fly over that planet, the clouds and the glowing plasma far far away with mesmerizing filamentary structures. And I also thinked about something that looks like a dream; you all know that Io charges itself with the radiation of Jupiter's belt and magnetosphere to the point where he developes voltages of 400'000 volts and currents of nearly one million amperes. This generates an arc discharge beetwen regions of the moon (called hot spots) and the planet itself. We can't see these lightnings because they occur in almost perfect vacuum enviroments. But if we are talking about a moon like Io near the "plasma planet" then the discharge could in principle ionize the plasma-gas of the magnetosphere making the "thunderstorms" visible. Immagine contemplating that beautifull connection beetwen a planet and some of its moons, in a sea of colorfull glowing gases with a lightning striking through space in a "fireworks show". You may think that this is some crazy thing I have come with that has no sense (I would like to know why? if that's the case ). The fact is that these "plasma planets" are more real than you think. The Earth itself has something called Geocorona and Plasmasphere that it's quite the same thing. The difference is that is not visible, but in more extreme conditions maybe it glows in visible light and not in UV as I have shown here. Plasma Planets are planets whose plasmaspheres radiate in visible light instead of the 30,4 nm (as Earth does). Is this posibble and how frequent can be in the Universe? Could Space Engineer implement this spectacular phenomena in the code one day? Could this be added to the TODO-list? This is going to be amazing folks!! I sort of second that idea. While this would be amazing (and make plasma planet so beautifully evil), I think we could extend that to having non "visible light" modes to see infrared and ultraviolet glowing off of planets. I've never seen that Apollo 16 image before, it's utterly beautiful! Yes, I agree totally. But as shown here that would be extremly complex and for the far future of SE's development. I was searching something that acctually happens in visible light so maybe Vladimir wants to add it to the code in the near future. This would be awesome. Spectacular and inspiring. It would be great if some astrophysicist could tell us if this planets are possible or if the glowing plasma dissipates in less time that we immagine.